Lakes and streams are an essential supply of freshwater. Monitoring their water quality relies on measuring their chemistry. Researchers from ETH Zürich and the British research institute CEH have discovered that dozens of chemicals in streams fluctuate with a specific pattern, one that makes their future behaviour difficult to predict. "Despite decades of monitoring water quality, there is still a lot we need to learn about the processes that control the chemistry of lakes and streams," explains James Kirchner, professor of the Physics of Environmental Systems at ETH Zurich and Senior Scientist at the Swiss Federal Research Institute WSL. Working with his colleague Colin Neal of the Centre for Ecology and Hydrology (CEH) in Wallingford, England, Kirchner set out to learn more about such processes, with the help of one of the most detailed water quality data sets anywhere in the world. Kirchner and Neal discovered that chemical fluctuations in stream water appear to follow a distinctive, universal pattern, one with implications for how we think about trends in water quality. 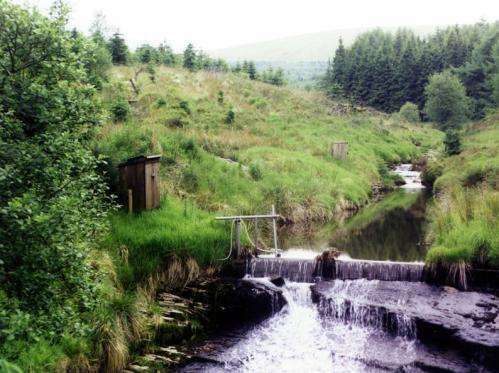 Kirchner and Neal analysed the concentrations of 45 chemical constituents in rainfall and stream water in two headwater catchments in the Plynlimon area in Wales. They combined nearly three decades of weekly measurements with an intensive campaign of measurements taken every seven hours for two years. Using this unique database, the researchers could analyse chemical fluctuations over a wide range of time scales, from hours to decades. When they compared the variability of these chemical signals in rainfall and in stream water over this broad range of timescales, they discovered a surprising relationship between signal strength (amplitude) and the cycle length of the fluctuations. In stream water, the signal amplitude of all 45 chemicals grew larger the longer the cycle length (the lower the frequency). That is, year-to-year variations are larger than week-to-week variations, which in turn are larger than day-to-day variations. Kirchner and Neal found that in stream chemistry, amplitude increases with decreasing frequency in a particular way which mathematicians call "pink noise" or "flicker noise". In contrast, rainfall chemistry varied in a more familiar "white noise" pattern, in which fluctuations have the same amplitude across all frequencies. "It really surprised us to see a pink-noise relationship between amplitude and frequency, for every element we analysed, clear across the whole periodic table," says Kirchner. To explain the transformation of white noise in rainfall to pink noise in stream flow, Kirchner compares it to what happens when our neighbours have a party with loud music: what we mostly hear are the low-frequency bass notes, because they are damped less over long distances. Similarly, low-frequency chemical fluctuations – for instance from one year to the next – are transmitted better than the high-frequency ones as rainwater makes its way through a landscape to become stream flow. However, chemical fluctuations are very different from sound waves, for instance in that some chemicals are more reactive than others. Additionally, they differ in their origin: some originate in the atmosphere and reach the earth dissolved in a drop of rain, while others may originate from mineral dissolution or from decomposition of organic material. Still, when they reach a stream, they are all dispersed in a way that dampens high-frequency fluctuations and leaves low-frequency ones mostly unchanged. Why neither the origin of the chemical, nor its reactivity, affects this process is not yet clear. The discovery that chemical signals resemble pink noise has important implications for water quality monitoring programs. Normally, researchers and water quality managers rely on the assumption that repeating measurements over longer and longer periods will yield increasingly accurate averages, and increasingly reliable trends. However, this appears not to be true for the chemical signals measured in a stream because pink noise is "non-self-averaging". This means that averages calculated from repeated measurements over longer and longer time periods do not become more and more stable. According to Kirchner, measurements of water quality often reveal "statistically significant trends – but while these trends hold true for the past they are surprisingly poor guides to future trends." Kirchner and Neal's study, recently published in Proceedings of the National Academy of Sciences (PNAS), suggests that researchers need a new way of thinking about trends in water quality as past trends cannot easily be extrapolated to the future. Estimating how the water quality of a stream will develop over the next few years, based on previous long-term measurements, becomes complicated in view of the "pink noise" pattern of chemical fluctuations.